Sales and PR have a lot in common—even if both sides are reluctant to agree. Sure, the goals are varied, the methods are unique, and even the personalities among types of professionals can greatly contrast. But there are still elements that can be borrowed from sales and repurposed for success within PR. 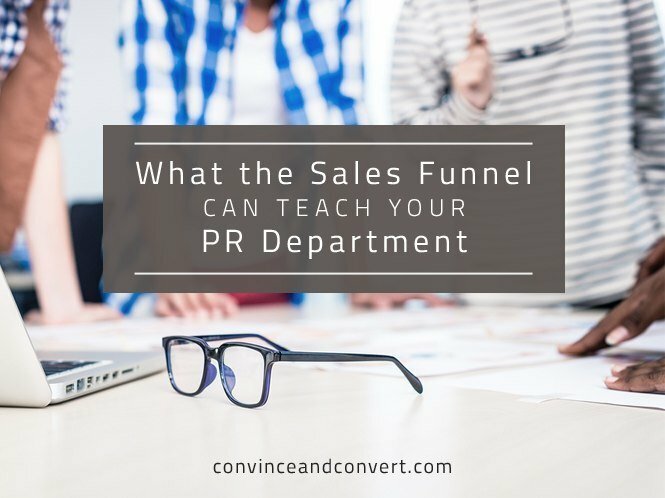 How can you leverage the traditional sales funnel and tried-and-true sales techniques to lend powerful insight to your PR efforts? It’s time to think like a salesperson. We know relationships are everything in PR, but sales folks tend to use relationships a bit differently. Rather than simply inquiring about a prospect’s child or buying him a cup of coffee, they take time to understand their pain points and use that to move them through the sales funnel. This might sound disingenuous, but it doesn’t have to be. Let’s say you’ve spent months corresponding with an editor, sending them relevant news and story ideas, and sources for pieces they are working on—some of which may not have even been related to your clients—but there’s still been nothing to show for it. At this point, you might be feeling some heat from your boss or a client to get some traction. This is where the savvy of the sales pro comes into play. From the beginning, a good sales person has their prospect’s pain point top of mind. Understanding the problem they need to solve for their prospect and what motivates them helps direct their conversations and strategy. PR pros should be taking the time to understand the journalist’s pain points. More often than not, journalists are contending with pressures to increase readership and churn out more content but have few resources to do so. Find out what their specific challenges are, then determine how you can help. If you discover there’s a perfect way your client can help achieve their goals, then by all means, suggest it. If not, see if there’s another way you can be of service. It might not mean a mention of your client or brand right now, but it could raise your standing in the eyes of this influencer and lead to a greater willingness to return the favor. In other words, focus on the relationship first, and become a problem solver. If you can be a true ally to your media contacts and influencers, you just boosted your value as a PR pro. Long before the digital age, top-earning sales leaders depended greatly on their Rolodex. That mini filing cabinet was their pot of gold, as it contained business cards flagged with pertinent information about prospects and their buying stage. With the advent of customer relationship management (CRM) systems several years ago, this entire process continued, but in a digital forum. By recording prospects’ contact information and demographics, along with how far along the sales funnel they are, salespeople tap into the power of data to fuel their actions. PR pros can do the same. If you find yourself scrambling to find notes you jotted down about a reporter, or spending far too much time scouring your email history to determine what you last said to an influencer, you’re shooting yourself in the foot. It’s time for you to learn from the sales masters and invest in a CRM tool or similar technology. You can’t analyze what you don’t measure. Do away with acting haphazardly, and start capturing and measuring your interactions and results. A key difference between the traditional sales funnel and the journey a PR person takes with a member of the media is that the sales funnel culminates in one thing: a sale. The PR pro, conversely, isn’t always dealing with just one potential outcome. This is where it becomes important to make a conscious decision about your goal. Let’s say you’ve set the goal of familiarizing a key influencer with your client’s software. What are the goals of engagement with the journalist? Sure, you want them to cover your client, but if that doesn’t happen out of the gate, what are the steps to move this contact down your PR funnel? For example, if you are lucky enough to get a “no” instead of just an ignored email, do you follow up with a respectful “why?” You might learn that they really don’t cover startup software, only enterprise, etc. The next question is, what do you do with that journalist, and how do you ensure that your entire team is aware? Sales people know where to put their leads within the funnel. Our PR team sets quarterly media outreach goals. They set a goal to engage with specific journalists at least two times per quarter with a goal of a response—any response. From there, they decide if it’s time to move on to another contact or revise the strategy. Sales people don’t waste time leaving unqualified leads in the funnel, and PR pros should take on that mentality. The Techcrunch founder went as far as drafting a PR pitch outline that he expects PR people to mirror when pitching him. What happens if you follow it to the tee and he doesn’t cover your client? This is the definition of PR measurement in its purest form: measure how many times you pitched him and the results. Is this the best use of your time? All this is to show you that your funnel in PR isn’t going to be as neat and tidy as the typical sales funnel would be. But that’s okay. What matters is that you’ve defined your goal and are taking steps to get each member of your intended audience there. Get yourself in the habit of recording and measuring your media interactions, efforts, and results, and shift your thinking about the ways in which you nurture relationships with the media. By being intentional about the goals within your own funnel, you’ll be on your way to garnering a better return on your investment of time and labor, and PR results that’ll make you proud. Aly Saxe is the founder and CEO of Iris, software for agencies and in-house PR teams. She founded Ubiquity Public Relations, an agency representing high-growth B2B tech startups, in 2007.